So Addie and I were out walking again this morning, and today is a gorgeous day. A little hot, and later I went running and had to stop early because the sun was beating me up, but otherwise today is very cheerful. Ashland really seems to be running on all cylinders now. We were here first in November, and saw the final week or so of the Shakespeare Festival. And then the whole town felt like it went to sleep. It was sort of nice, I thought, but maybe that's because I have a slight aversion to crowds. And since March it's been picking up again but finally now in June the whole town feels alive. Probably because school is finally out so everyone is on summer break now. Get some crepes. Sit outside and eat them. Kelly's Crepes looks new, certainly in the last few weeks, and I'm not sure if it is a summer pop-up or if they just have a seasonal schedule. They are at 5th and A street and look to be quite popular already. My wife has been having fun going to garage sales around here with my mother-in-law. She says the prices are great, the people are fun and she's found lots of great stuff for Addie. It feels like pretty much every time we have a nice day a few garage sales pop up around town. 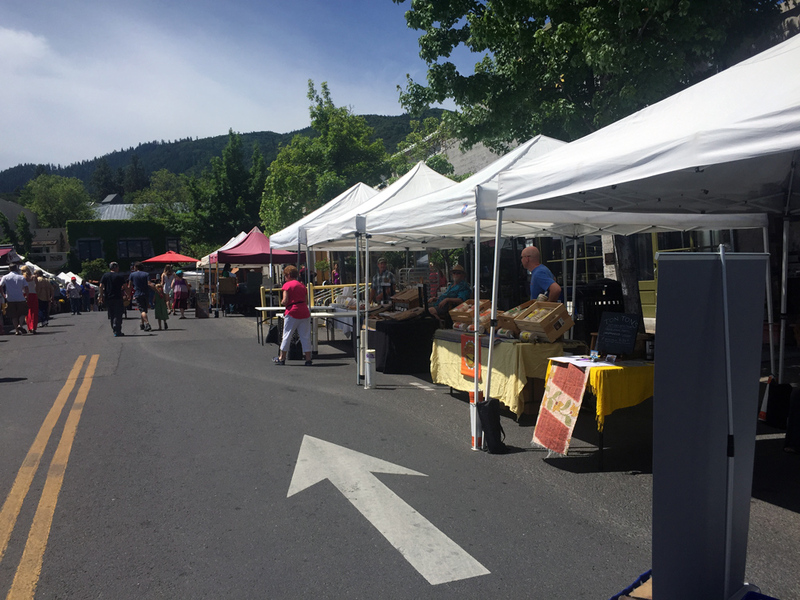 Saturday morning Farmer's Market in downtown Ashland. A good selection of fruits, berries, vegetables, flowers, and pastries. We love to support local farmers whenever possible. The downtown Farmer's Market started up in May (I think) and it is now in full swing. Get there early if you want one of the rhubarb pies because they always seems to run out. They run from 9am to 1pm. Ok, gotta go, there's a deer having a baby in my yard.